Arrive in San Francisco by plane, train, automobile, motorcycle, bus or cruise ship and beeline to its most decadent and sociable place to purchase and consume cannabis — Barbary Coast, named for the city’s mid-1800s vice district. Step off gritty Mission Street and flash back to an earlier San Francisco where velvet-flocked wallpaper, silk rugs, tuck-n-roll banquettes and rich wood bars evoke saloons and bordellos Mark Twain and his brethren frequented after the Gold Rush. In the smartly stocked retail shop, peruse an 11-page menu featuring detailed product descriptions and lab-tested purity and potency results, or quiz budtenders about flowers, joints, concentrates, topicals and edibles. In the lounge, borrow state-of-art paraphernalia, learn to dab and vape from trained staff or just enjoy toking with friends in a comfortable environment in which smoke is silently sucked from the room and scrubbed from the air before it leaves the building or soils your clothes. Walk a block and a half to Market Street, hop on a vintage west-bound streetcar and hop off at Flore, the 45-year-old iconic cafe which endures as a humble clubhouse for gay cannabis activists. People-watch from patio and sidewalk tables while munching stoner bar snacks like chicken-fried bacon and drinking cannabis in the form of cocktails crafted by the cream of San Francisco mixologists. Cocktails contain 5 mg of non-psychoactive hemp-derived cannabidiol, or CBD, and the benign, distilled essence of select cannabis strains. Toast late cannabis icons Dennis Peron and Brownie Mary, who met here in the Seventies and influenced the politics and possibilities of people and pot for their own and future generations. Double back on Market Street and hit The Apothecarium, San Francisco’s elegant and welcoming mothership of high-end cannabis retailing that operates three luxe boutiques locally and one in Las Vegas. Here in the heart of the Castro District, where California’s historic medicinal cannabis movement and today’s spreading legalization juggernaut were born, you’ll find an excellent selection of the best brands, plus smart and friendly service from budtenders who ably answer questions like Is microdosing for me? and What’s the cacao content of that cannabis chocolate bar? By now, the cannabis you’ve consumed is likely an excellent appetite aphrodisiac and eye-candy enhancer for dinner at Leo’s Oyster Bar, an exuberant fever dream bursting with tropical wallpaper, pink onyx bar and enough well-dressed pretty party people that you won’t blanch at pricey cold seafood. For those experiencing pot’s gustatory perks — primarily, intensified curiosity for new and continuing pleasures — Leo’s orchestrate-your-own oyster, caviar, lobster, crab and shrimp platters, smaller bites like creamy hot deviled eggs studded with crispy fried oysters and larger plates of mussels, salmon and short ribs stride the line between indulgence and flexibility, maintaining room for desserts by local pastry queen Emily Luchetti. 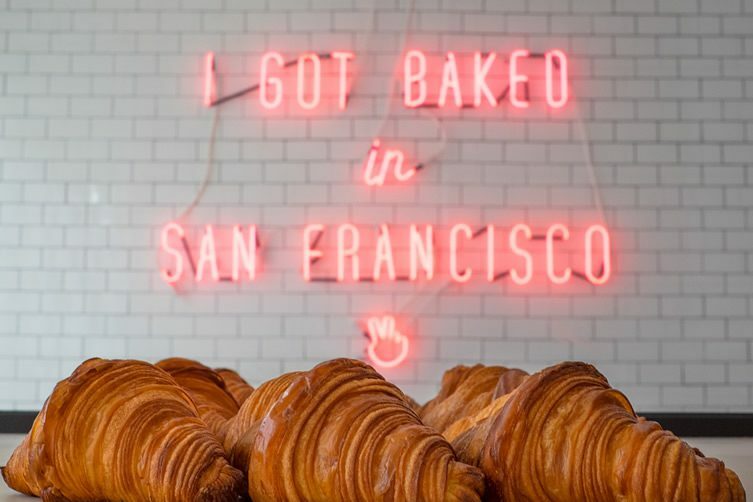 Since most cannabis lounges don’t open until 8 a.m., you may have already sneaked your first toke of the day in your hotel or during an early-morning walk — cannabis connoisseurs’ beloved “wake and bake.” But now, it’s time for Mr. Holmes Bakehouse and its motto: I got baked in San Francisco. This quirky Tenderloin bakery wakes up sweet and savory breakast pastries with brio and frivolity. Adventuring traditionalists will try Cruffins, popped-over croissants baked in muffin tins. Pothead foodies will salivate for flaky sushi croissants stuffed with baked salmon,-ginger -wasabi nori rolls. Ask cannabis connoisseurs which beverage pairs best with the botanical herb and most will answer coffee — a polymorphically fragrant and flavorful intoxicant whose attributes harmonize with cannabis. Until SPARC, sleeker and friendly than Apple stores, starts selling $2 cup of bio-dynamic organic drip coffee like it told it soon will, grab a cup from Blue Bottle around the corner on Market Street. SPARC only allows vaporized cannabis at this hour, but no matter — SPARC provides state-of-the-art Volcano vaporizers that capture floral, fruity, woodsy and leathery notes of cannabis, complements to similar qualities in coffee. Buy and vape an uplifting uplifting sativa strain and enjoy enthusiastic conversation over cannabis and coffee with companions and strangers alike. Many local cannabis tours (there are several to choose from) hit the obvious (the Haight-Ashbury) and stop at top cannabis stores and lounges. Given stores’ and lounges’ proximity to hotels, museums, shopping and entertainment, it’s easy to solo your own tour. The Denver entrepreneurs who pioneered cannabis-friendly activities with Puff Pass and Paint smoke-it-if-you’ve-got it art classes operate a tour that pairs two Bay Area obsessions — cannabis and wine. Start across the Bay with musician Melissa Etheridge’s cannabis-infused wine at the Oakland Cannabis Creative, then limo back to San Francisco (you can smoke in the vehicle) and go inside cannabis cultivation facility The Betty Project (you can buy what you see via delivery service), after which you’ll cross the Golden Gate Bridge for wine-paired lunch at a Marin County winery before heading back to Oakland ($99 per person). Why wander the Haight-Ashbury, where the age of Aquarius approaches the age of retirement and pot-branded Cookies hoodies cost $100? Do your body better at five-star St. Regis Hotel, where Remede Spa offers Love and Haight hot-oil cannabis massages that will soothe you, not stone you. Instead of working your body with traditional essential oils, masseuses use non-psychoactive hemp oil containing popular anti-inflammatory compound CBD and no trace of THC, pot’s euphoric compound. CBD may be therapeutic but it’s not cheap relief. Sixty-minute massages cost $275 each but come with access to separate men’s and women’s whirlpools, saunas and steam rooms, plus Champagne and chocolate truffles. Physically closer to the Haight-Ashbury and slightly cheaper, Kabuki Springs & Spa’s CBD massages start at $137.50. If you’re loaded enough to stay at the St. Regis, enjoy your room’s extra-deep tubs with a generous sprinkle of Maya and Whoopi’s medicated bath salts purchased from The Apothecarium. There are two approaches to cannabis cuisine. One puts cannabis in food, using mains, sides and condiments as delivery systems for highly processed forms of cannabis, which, while enhancing foods’ aromas and flavors, are not instantly enjoyable as the onset of edible cannabis’ effects can be delayed for two hours. The other approach pairs different strains of smokable and vapable cannabis with different meal courses, a different experience of flavors and instant effects. That’s how Coreen Carroll prepares and serves her four-course Cannaisseur Series dinners ($150 per person), which emphasise the symbiotic bonhomie pot brings to the dinner table — heightened smell and taste sensations, intensified focus on nuances and a dash of je na sa quios that enhances the whole. Say “sweet and savory hand-cut buttermilk biscuits” three times fast and prepare to get your opinion of biscuits bent at Biscuit Bender, the Ferry Building vendor that loads the most basic of all flour-butter-water-leavener baked goods with ingredients like Mexican chocolate, lemon-poppy, mushrooms, maple and bacon and corn and jalapeno. While you’re at the Ferry Building, load up on El Porteno’s empanadas — flaky Argentinian pastries loaded with meat, egg, raisins, olives and more. Don’t forget to grab Blue Bottle Coffee. Get everything to go and head to Mark Twain Place. A short walk from the Ferry Building, Transamerica Pyramid was built on the site of another icon — Monkey Blocks, the amalgamation of saloons, brothels, newspapers, rooming houses and other businesses of the mid-19th century, when cannabis was legal and Bohemians like twentysomething Mark Twain tripped the bawdy Barbary Coast on hashish candy purchased at pharmacies. A short street dead-ending into cool, shady Transamerica Redwood Park is named for Twain, but it was on nearby Clay Street where the famous-author-in-waiting once ambled under the influence, trailed by police, prompting one 1865 newspaper report of “hasheesh mania.”Speaking of which, Mark Twain Place is a good place to melt Hashman caramels or chocolates into your coffee for breakfast al fresco with Twain. The San Francisco Museum of Modern Art’s restaurant serves “borrowed” dishes “on loan” from world-renowned chefs and recently won the the James Beard Foundation Award for Outstanding Restaurant Design (76 seats and over). Feast your eyes on intentionally spare alternate dimensions then mosey into the museum. No, Burning Man didn’t open a cannabis store and lounge. Urban Pharm just looks like the cannabis theme camp of Playa pipe dreams — steampunky, moody and cozy. The posted 20-minute lounge limit is just the right amount of time to enjoy one of Urban Pharm’s pre-rolled joints but if your plane’s delayed and you want to linger and fog your consciousness with concentrated cannabis oil at the dab bar, no one will hassle you.